Figure 2 shows the assembly of the packaging container. First of all, the grid of each part of the packaging container is discretized, and the appropriate unit type and density are selected according to the role of the part in the packaging container. For example, the thickness of the box is 2mm, and the shell unit may be used; the pressure plate and the chassis are subjected to bending effect, so at least two layers of hexahedral units are distributed in the thickness direction, and the rubber pad hardly bears the bending effect, so the thickness direction can be Only one layer of hexahedral elements is distributed. The final meshing model is shown in Figure 3. According to the assembly drawing of the packaging container, the grid model of each component is assembled, as shown in Figure 4. The two flanges are respectively welded with the upper and lower tanks, and the flange and the tank are connected together at the joint node in the grid model; the upper flange, the partition plate II, the upper tank, the inner cylinder and the The foam is integrated and the lower flange, the lower tank, the spacers I, and the backing plate are joined together by the foam. In the mesh model, the objects are handled at the connection joints; the bolting failure of the packaging container during transportation is achieved. 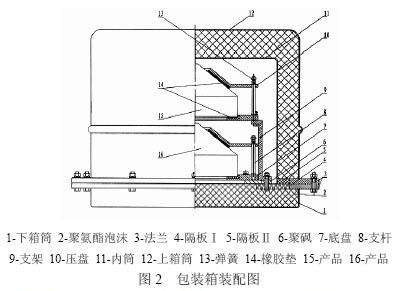 The possibility is very small, regardless of the failure of the bolt, the bolting method is simulated by the use of a rigid beam element; the connection of the pressure plate to the chassis is handled by the use of a beam element plus a spring element connection between the two, by applying a spring force. Press the product with an initial spring force of 100N; set the contact interface between other parts that may interact.